After my first experience of surfing I was adamant this was not a midlife crisis, a phase, a fad, a fling or a fleeting interest. I know that some friends thought it was, especially when I joined a gym and stopped drinking on school nights after my first surf trip. This was out of character, completely and I know I have a tendency to get over excited about new things but, I knew surfing was different. Aside from the weight and fitness issues I had, which needed attention, I started to rethink what I was doing back at home. How could I change things in order to channel more time into surfing? Of course, holidays and surf trips are not real life but, I’d met so many people who were making surfing a priority and having the time of their lives so why not me. I wanted that daft post surf smile on my face and sand in my belly button on a daily basis! In pursuit of some sort of surf life, I have had untold ideas about how to make this happen. Below are the ones that made the shortlist, the ones I invested hours and hours of time into researching, planning, doing business plans, making contacts and even travelling for. My first surf lesson was in Corallejo, Fuerteventura in 2013 and I took rather a lot of trips there that year. So much so that I started to really feel at home there and I feel a strong connection to the place to this day. I became sure that my future as yet unknown surfing life lay there, somewhere, waiting to be stumbled upon and here my first plan was born. Hosting older ladies surf trips in Fuerteventura. My usp was me, approaching 40, having been significantly overweight prior to starting surfing, not being sporty in any way and still struggling. I was the best advert for my own idea, so I thought. There wasn’t much on the surf market aimed at women like me. 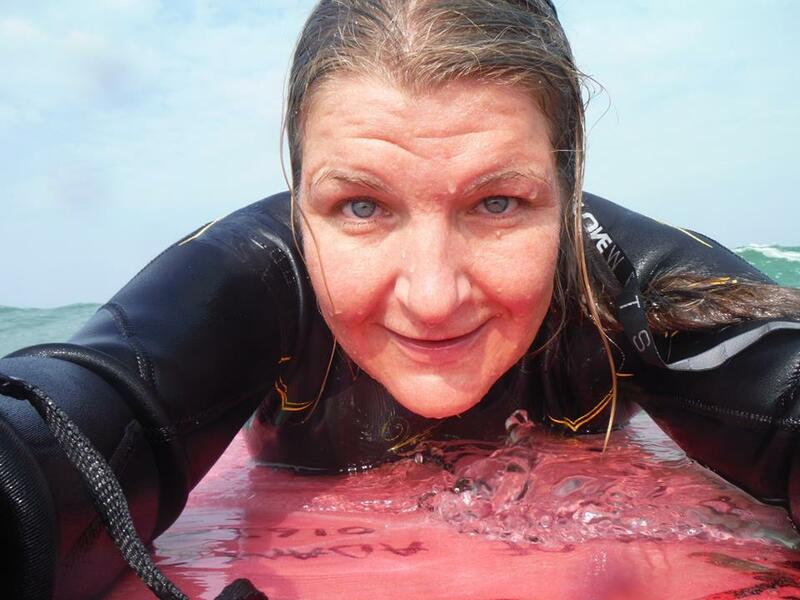 I wanted to share my surf epiphany and new lease of life with other women and to inspire them. I also hoped it would mean I’d get free surf trips! The idea faded as I only get 4 weeks leave a year and I realised that hosting a week or two of a surf trip would actually limit my own surf time. A great idea if only I had more leave. I still have all the costings and business plan somewhere perhaps in the future this is something I could look at again but, at this point it wasn’t meant to be. Off the back of realising Chubby Chargers wouldn’t significantly change my life style the next idea was to rent a villa, initially for 1 year and open it as a surf house in Fuerte. It was to be done with one of my best mates from Uni, both of us had worked in hospitality management for years so this would suit our skills. The surf house was to be called Casa Surfabella, now the name of this blog. We looked at some villas and came up with a concept and a vision of how it would operate. We did some sums and had a robust business plan. The stumbling block this time, the start-up money we’d need, we were both broke, living wage to wage and neither of us wanted to get into significant debt. This idea is not dead in the water and may be something to revisit. In between these 2 plans came the teaching English plan which was something I’d often thought about over the years and seemed quite straight forward. I already have a degree but, not a teaching certificate. Two years in a row 2013 and 14 I applied for a CELTA , twice I got a place on the course and twice I had my application for 16 half days of study leave over a year declined by my work. I couldn’t afford to do an intense course over four weeks or have the time off for it so, that was the end of that, for now. Next up came a chance to move to Bournemouth with Casa Surfabella Uni mate who has a flat down there. This seemed a no brainer! Get a job, move and live near the sea. Again, being of meagre means influenced the plan, I had to have work to go to and couldn’t just take off. I knew Bournemouth wasn’t exactly the best surf spot in the UK but, it could at least put me in reach of the sea every day and not too far from decent surf. This was when I realised I had to be driving before the move otherwise it would be torture to know I was so close but, couldn’t get there. Me and the dude went down to BM for a weekend, got drunk, looked at the flat, walked on the beaches, saw people surfing , adventured along the coast, drove past Monkey World and stopped at Stone Henge on the way home. I decided I could see myself living there and set about applying for jobs and trying to come up with a date to aim for. I remembered seeing the Monkey World sign and quickly became obsessed with working at Monkey World, I applied for a job there. 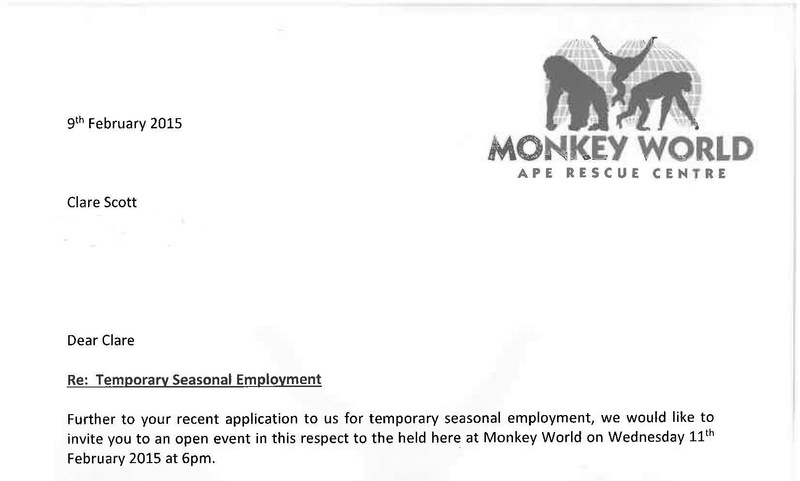 Soon a letter arrived with the Monkey World logo on, I’d got an interview at bloody Monkey World. I had it all planned out, work at Monkey World, surf and live in Bournemouth. I never did make it to my Monkey World interview because the next plan introduced itself. It’s probably a good job really because I often have uncontrollable laughter about monkeys that becomes very unfunny for others after about 10 minutes. There doesn’t even need to be a monkey within ten miles of me for this to happen, and yes I did just say Monkey World as many times as you think! Before I could take Monkey World any further a letter arrived followed by a quick day trip to Salisbury for an interview and a job offer. Suddenly everything had changed. Here was the opportunity to work our asses off in summer for 18 weeks (they said), work 90 hours a week (they said) and we’d be begging for a day off (they said) have the winter off and come back in time for the next season (I thought) and so the idea of The Perfect Year was born. I planned my Perfect Year, starting in September I would visit the European WSL tour stops, I even booked a hotel in Hossegar for the Roxy pro and made plans with Landlocked Surf Girl . After that I’d go to Canaries and Morocco for the European Autumn before heading out to Central and South America after Christmas for the rest of the year. I planned to spend some time in Cost Rica and get a sloth as a pet. At last I felt a massive sense of freedom and relief, like I could breath, a weight had been lifted off my chest. This was it. As I made plans, wrote lists and looked at dates I could finish work to start the events season I got an email detailing the work schedule for the summer and my heart sank. There were huge 20 day long gaps with no events, they’d told massive porkies! With this schedule I wouldn’t even break even and no way would I be able to have a perfect year. After speaking to the porky tellers I reluctantly had to accept that this was not my route and I got into bed for 2 days and hid from my distinctly non sandy belly buttoned, landlocked existence. After about a week of succumbing to feeling really miserable about my plans falling to pieces and fear of never being able to sample a life of surfing a really simple idea came to me from out of nowhere, I was just going to ask my boss about a 4 month sabbatical so I could at least salvage some of the perfect year. Why hadn’t I thought of it before? I’d like to talk to you about a permanent possible change to my working hours can we make a time to meet? In the meantime, because I knew whatever happened I had to get mobile, I started driving lessons. I gave myself a 5 week goal to get my test passed. On 27th April I passed my test and 5 days later collected my car, The Baked Bean. Somehow, things were starting to look like they were about to fall into place! Finally, last Friday I received this letter………………………….. So there we have it, freedom and security. After all the trying this and trying that I found my Endless Summer right under my nose and it really will be endless as I have this freedom every year. I get to keep my little flat and my life here. I never really wanted to leave I just wanted more time to surf. I get to stay working in a pretty cool job but, I’ll have 13 weeks a year to do whatever the hell I want! I might even be able to revisit some of those other plans I made. Maybe you will see the Chubby Chargers on a beach in Fuerte staying at Casa Surfabella next summer, who knows? In pursuit of whatever it is I’m trying to do, as I’m still not sure what it is exactly apart from surf more , I have finally carved a path to the beach. I still have no idea what I’m going to do when I get there but, as long as I have my board, some waves and a belly button full of sand then I’ll know I’m on the right track. I felt some pain reading this story. Mainly because I know the joys of hitting on some good ideas but then knowing that you are not in the position to go into debt to make it happen. But thankfully things work out and it is great that you made it to the beach. I am sure landlockedsurfgirl will be visiting frequently! Hey Steve, thanks for reading. At last everything is in place, learn to drive, buy a car, get time off. All done, all so much simpler than I thought it could be. Little landlockedsurfgirl is sure to featrure in the coming adventures and hopefully we will catch up with you when we hit the Gower . Now just to get through this final summer of work !